Soap making has become quite the new addiction for me after reading the Natural Soap Making eBook Collection. And one of the most fun aspects of it is finding natural ingredients to incorporate into my batches for their benefits! There are a few ways to add them in and one of them is by infusing your own oils. Infused oils aren’t as strong as essential oils and usually don’t carry over a scent. But they still help in incorporating the natural benefits of a plant! There’s a huge range of herbs and medicinal plants out there that you can choose from. But, most recently I made a Harvest Orange soap! So, in this case I infused one of my oils with orange peels! So how do you start infusing your own oils? I learned about infusing oils after reading the Natural Soap Making eBook Collection. 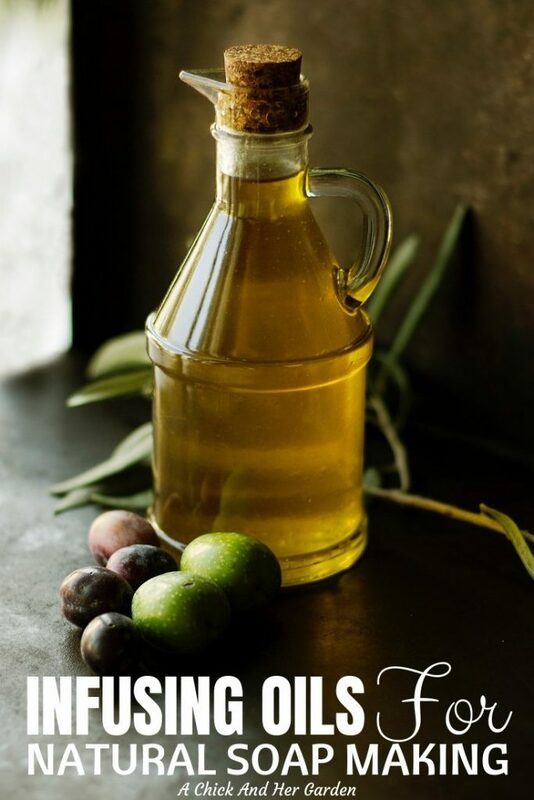 There are two ways that you can start infusing your own oils. A quick way and a slow way. If you’re using fresh herbs (or orange peels) allow them to wilt for a day to extract some of the water. Chop them up and pack them in a jar. Cover the herbs with oil, typically I use olive oil. This is also a bonus because it could be used in cooking as well! Close the jar. Lids like this are great and I use them for EVERYTHING! Place it on a sunny window sill and keep it there for a couple of weeks, shaking it periodically. Strain it through a coffee filter and store in a labeled jar until you’re ready to use it. I love using chalkboard labels! Now for infusing your own oils the fast way! Yes it’s one of my flaws. I’m so spur of the moment that I tend to need immediate gratification. As I said before, I usually find myself with a random moment of free time and decide I want to do something. On these days I can’t wait to weeks for an infused oil to be ready, or I’ll completely forget about even making the soap down the road! So, if I need it for that day, here’s how it’s done. Again, you want either wilted or dried herbs. Cut and pack them in a jar. Cover the herbs with your oil. Now here’s the different part. Take a small pot and fill it with about 3 inches of water. Place the open jar in the water and turn the heat to medium low. Make sure to keep an eye on it so your water doesn’t evaporate and add a bit more if needed. Strain your oil and allow it to cool down. In the words of my daycare kiddos, “Ta Da!” That’s it! Now you have infused your own oils! For a list of great herbs and plants to use in your soaps (among many other uses) check out my post on What to Plant in Your Healing Garden! Like I mentioned before, I learned this soap making tip in the Natural Soap Making eBook Collection! It’s my soap making bible and is how I learned how to make soap and write my own recipes! If you want the wealth of knowledge that Jan Berry has to offer, you can grab your copy here! Ready to make your own soaps?? Here are a few recipes to try out!